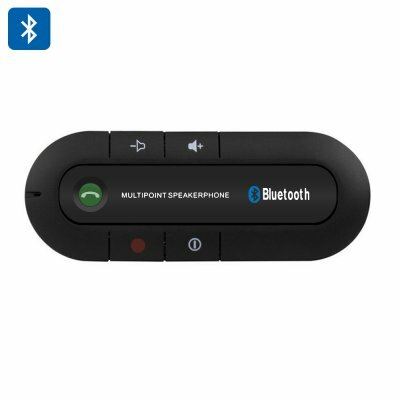 Successfully Added Hands Free Bluetooth Car Kit Speakerphone - Bluetooth 4.0, 600mAh Battery, 20 Hours Talk Time, 1000 Hours Standby to your Shopping Cart. Simple, Easy, Wireless Hands free wherever you may be. This universal hands free Bluetooth car kit clips to your sun visor and is the perfect accessory for taking calls in your car. With Bluetooth 4.0 you get an energy efficient stable and secure connection between any supported devices and the 10 meter range means you can use this hands free kit at home, work or in the car. With a magnetic back clip it’s quick and easy to fasten to your vehicles sun visor or clip to you belt or desk, and when not in use you can easily remove the speaker phone and slip it into your pocket. The one touch answer means you won’t need to leave off what you’re doing to take a call and large control keys make for easy use. With a built in 600mAh lithium battery this you get up to 20 hours of talk time and a massive 1000 hours of standby allowing for extensive uses between charges. Should the battery run down you can use the USB lead to recharge the device in just a few hours. This Hands free Bluetooth Car Kit Speakerphone comes with a 12 months warranty. Brought to you by the leader in electronic devices as well as wholesale Bluetooth gadgets..